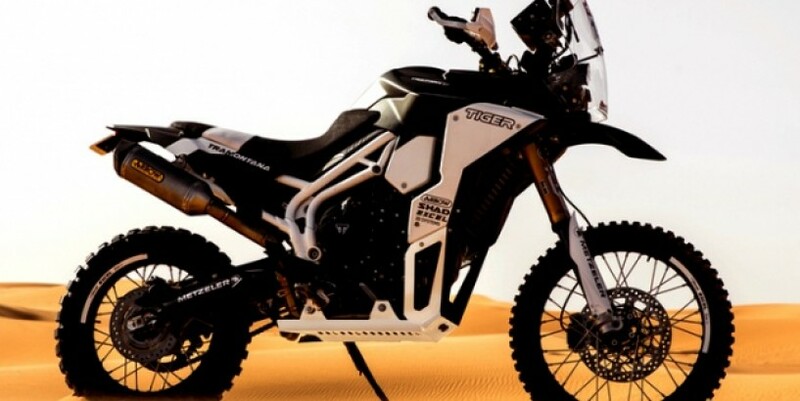 Taking a standard Triumph Tiger 800 XCx, brothers David and Felipe Lopez have created the Tiger Tramontana off-road rally race bike, which they intend to race in the Pan-African Rally. The 2,000 km long race sees competitors pitting themselves against the 40-degree heat and powder-fine sand of the desert in Morocco, Africa. Developed with collaboration with the works team in Hinckley, the Tramontana took six months to build, with Triumph engineers putting in time outside of work hours. Both David and Felipe are currently in training to see which of them will take the “race into hell”, the unofficial moniker of the Pan-African Rally which is held over five days from the town of Erfoud. Named after the north wind in the Pyrenees mountains in Spain, the Tramontana takes the 95 hp at 9,250 rpm and 79 Nm at 7,850 rpm, liquid-cooled, three-cylinder power plant from the XCx and places it in the Tiger’s frame, but with a shortened sub-frame. Other changes in the interests of increased performance include lighter headlights, a one-ff windscreen, modified body panels, sump guard, seat and rear mudguard. The biggest change is to the front of the standard Tiger XCx, with the Tramontana sporting a much taller Paris-Dakar Rally style front fairing. This is so that the Tramontana can accommodate the rally’s Roadbook, ICO and GPS beacon, all of which are essential to ensure the rider does not get lost in the immensity of the North African desert. “The modifications we’ve made to the Tiger Tramontana take the all-round capability of the Tiger 800 to a much more focussed level required for this type of extreme off-road riding, so the off-road capability has been enhanced significantly to be comparable to all of the rally enduro racing bikes in the field,” said David. In Malaysia, the 2017 Triumph Tiger 800 XCx adventure bike retails for RM72,900 while the more road-biased 800 XRx goes for RM67,900 . All prices include GST, but exclude road tax, insurance and registration.